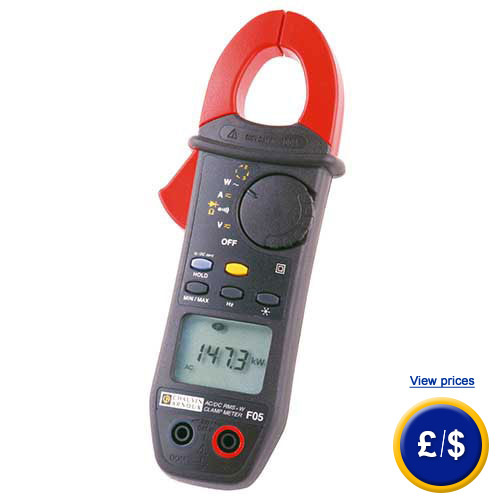 The DC Clamp Tester F05 combines a clamp meter and a power meter. Besides measuring altenating and direct currents, the clamp tester can determine the electrical power up to 240 kW. The clamp tester is also able to measure the voltage exactly up to 600 V. Therefore it does not matter if the current, which is metered by the clamp tester, is alternating or direct. In addition, the clamp tester offers many other multimeter features like electric resistance measuring, continuity testing and diode testing. The clamp tester can also detect the inrush current of engines. For enhancing the durability of the battery, the clamp tester comes with an automatic shutdown function. Due to the clamp diameter of 23 mm, the clamp tester is suited for many different measuring tasks. The easy handling of the clamp tester allows quick hardware checks and makes it very beneficial for every service technician. If there are any questions about this Clamp Tester F05 have a look at the technical specification below or call: UK customers +44(0) 23 809 870 30 / US customers +1-410-387-7703. Our technicians and engineers will gladly advise you in all clamp meters and all products in the field of measuring instruments, regulation and control and scales.